A quieter weekend for the Vikings, with the Premier Division sides on a Bye. The 1st Division sides took on RMC at Viking Park, while the ViQueens played two matches in their Preseason 10s tournament out at North Oval. The Vikings went 3/4 on the day, but there was some promising signs from all involved. The ViQueens kicked off their Preseason 10s tournament at 10:25am, taking on Goulburn. The girls won the game comfortably in their first hit out since the Easts trial, 20-5. Their next game wasn’t until 1:55pm against the Gungahlin Eagles, but the lengthy break didn’t have an affect on the girls, who played a shutout win 30-0. From all reports, all the ViQueens who played on the day were excellent, their long Preseason paying dividends in their ability to gel as a team. This was particularly evident in their last game, where they only had 10 players on hand. The ViQueens will only get stronger with the expected return of the Brumbies Super W players, too! 4s kicked off proceedings at Viking Park, taking on the 2018 Premiers RMC. Interestingly the first 10 minutes of the game were played without a referee, who had the timings mixed up. Luckily John Gibson put up his hand to assist, despite having completed a 10km race only an hour previously. It was a tight first half for 4th Grade, who are starting to find their groove now that their team is finding some consistency. Contrary to most games against RMC, who’s fitness usually get the better of teams in the second half, it was the Vikings that ran away with the game in the second term. 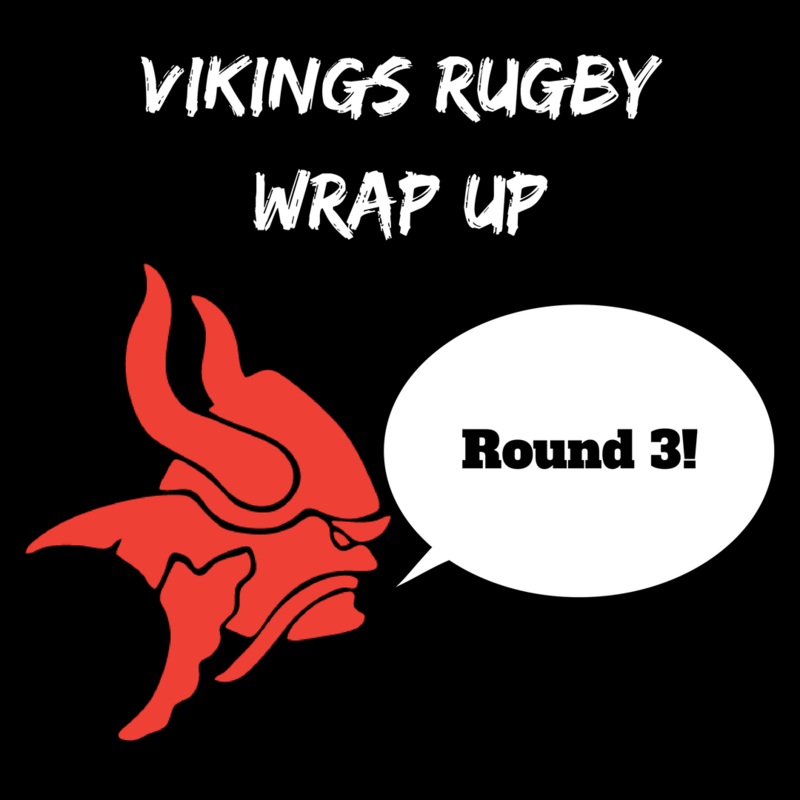 Led by their destructive forward pack, the Vikings rumbled their way up field and used their pace out wide to cap an excellent win. Toby O’Brien, usually a Fullback, killed it playing Openside Flanker with a Man of the Match performance. A welcome return for Robbie McNeill ensured that the scrum was back to its best, and Colt age player Tristan Aurisch was a handy addition at No. 8. Tom Brewer enjoyed his second game of senior Rugby, too, giving the 4th Grade backline some spark. A successful day for 4th Grade, winning 27-7. A disappointing result for 3rd Grade but a gutsy effort none the less, taking on an RMC pack who are rolling their success in 2018 into 2019. The Thirsty Thirds, who were bolstered by some 2nd and 1st Grade players returning from injury, had some really positive passages of play. Joe Langtry was outstanding in his first game back in Vikings colours, playing out a Man of the Match performance against his alumni and favourite team RMC. Englishmen Matt Wafer and Tom Carney combined well in the front row, too, their presence in the forwards setting a solid foundation at scrum time. 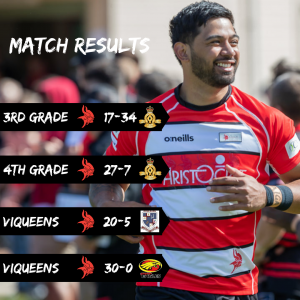 Contrary to 4th Grade, 3rd Grade’s lack of fitness compared to their counterparts showed in the match, as RMC were able to outplay the Vikings in broken field play and hold their discipline at crucial moments of the match. The Thirsty Thirds will need to work on their communication and basic skills over the Easter break, however Coach Sinclair was happy overall with the team’s performance and will take the result as an opportunity to improve. A well played match by RMC, who won 34-17. That’s a wrap for Round 3. All Grades have a break over Easter and will return the week after against the Uni-North Owls (Premier Division) and ADFA (1st Division). Happy Easter to all Vikings fans, see you on the 27th of April!